Homemade rooting hormone made from willow is free and easy to make. Use it for rooting cuttings or for easing transplant stress. You probably know that willow bark was the basis for the common over-the-counter drug, Aspirin™ or acetylsalicylic acid (ASA). Young willow twigs contain both salicylic acid, which serves as an antifungal, and indolebutyric acid, a hormone which encourages rooting. Commercial rooting hormone contains Indole-3-butyric acid, a concentrated synthetic version of this naturally occurring rooting hormone, as well as a chemical fungicide. 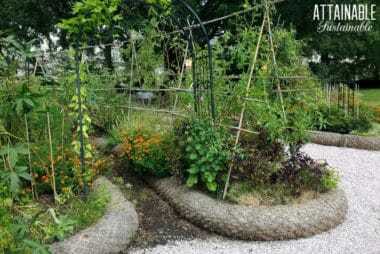 But if you are avoiding chemicals in your organic garden, willow is a powerful substitute. Oh, and did I mention it’s free and easy make? Willow rooting hormone works in two ways. You can soak cuttings that you plan to root in willow water for 24 hours and then plant them in soil. Or you can water already rooted cuttings with prepared willow water to encourage stronger roots. Using willow rooting hormone speeds up the rooting process. The antifungal properties of willow improve the success rate of your propagation projects. You can make as much rooting hormone as you need from one or two willow shrubs. Cutting the willow to make rooting hormone actual stimulates new growth in the willows. The willow that you have growing in your own yard has already produced defenses against the most common fungal and bacterial challenges in your environment. 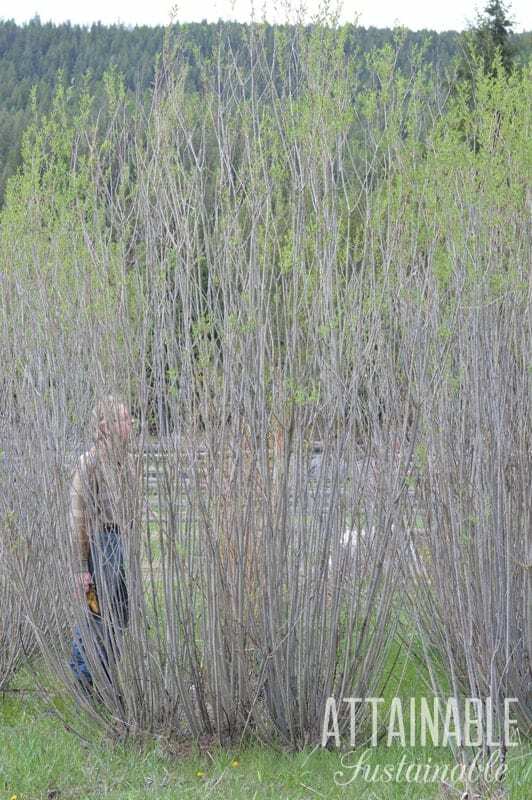 When you make rooting hormone from these willows, you are giving your new plants the defense they need against these pathogens, allowing them to put more energy into growth. This will improve your propagation success rate. While commercial rooting hormones contain a single fungicide and a single hormone, organically grown willow will have several synergistic constituents that will help with your propagation success. For this project I used a fast -growing Salix purpurea variety, but any fast growing Salix species will work. Trim the younger growing tips of willow trees that are no more than a pencil width thick. The bark should be fresh and colored, from last year’s growth. You’ll have some greyed bark, too, and that’s alright. Under the greyed bark there is more of what you need. Thicker woody pieces are too difficult to cut for this project though. Remove the leaves from the stems. Cut the branches into one-to-two-inch pieces. You don’t need to be exact. The more surface area that is exposed the easier the plant constituents will dissolve into the water. Place the willow pieces into a heat proof container. Fill the container half full of willow pieces. I used a half-gallon, wide-mouth Mason jar, so I needed four cups of cut up willow pieces. The bundle of willow in the picture turned out to be exactly four cups of willow pieces. Put the jar in a warm spot to preheat a bit before moving on to the next step. Boil some water. Take the water off the heat and let it cool down slightly, if you are using a heat proof glass jar. Pour water over the willow pieces in the container. Fill the container all the way up with boiling water. Cover the container to hold in heat. Let the willow steep for 48 hours. Strain out the willow pieces. Retain the willow water; this is your homemade rooting hormone. 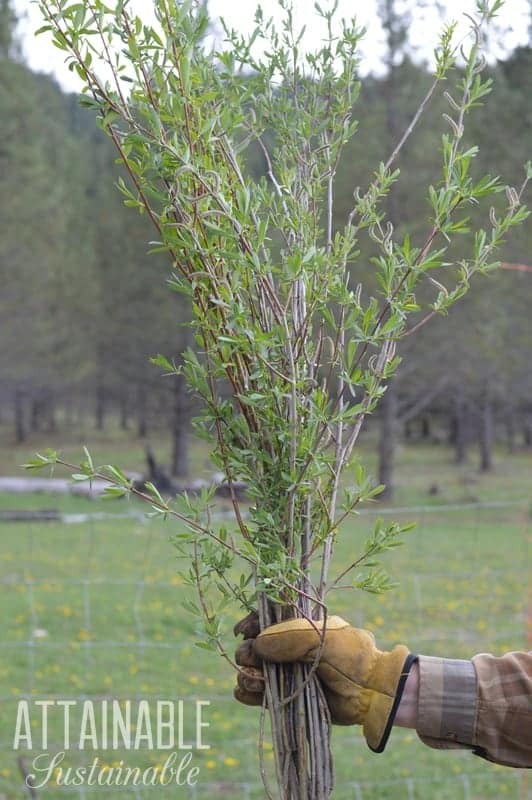 The best time to take softwood cuttings from ornamental shrubs and perennials is May or June, when the softwood cutting is no longer flexible but before the hardwood has begun to form. To root these, pour some water in a small vase or Mason jar. Soak the cuttings in the cooled willow water for 24 hours. Plant the cuttings in soil-less medium, in a pot. Cover loosely with a cloche or plastic bag to prevent moisture loss by evaporation. Softwood cuttings should be rooted in 6 to 8 weeks. To test the rooting progress, give the cuttings a small tug. If the plant resists, it is rooted. When you use your willow water, pour out just what you need into another container. To protect the integrity of your homemade rooting hormone, don’t pour the used solution back into the original jar. Use it to water plants, instead. Hardwood cuttings from plants such as cherry, plum, or roses are taken during the dormant season before bud break. Cut a branch that is about pencil thick. Peel the bark from the very bottom of the cutting about 1 inch long, down to the cambium layer, removing the thin top layer of bark. Trim the cutting to 6 inches long. Make sure there are at least 3 buds above the peeled bark, though more are okay. Soak the bottom of the cutting in willow water for 24 to 48 hours. Fill a pot that is at least 5 inches deep, with soil-less medium. Push the cutting into the soil-less medium so that two inches of it is below the soil surface. Water with more willow water. Cover with a cloche or a plastic bag to retain moisture. 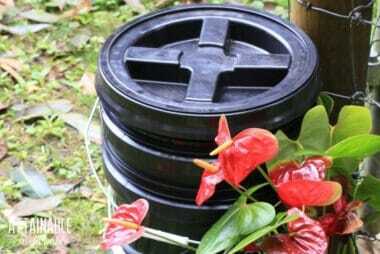 Place the pot in the shade in a sheltered location or in a greenhouse, protected from freezing temperatures and high heat. Water only when there is no more condensation on the inside of the cloche. 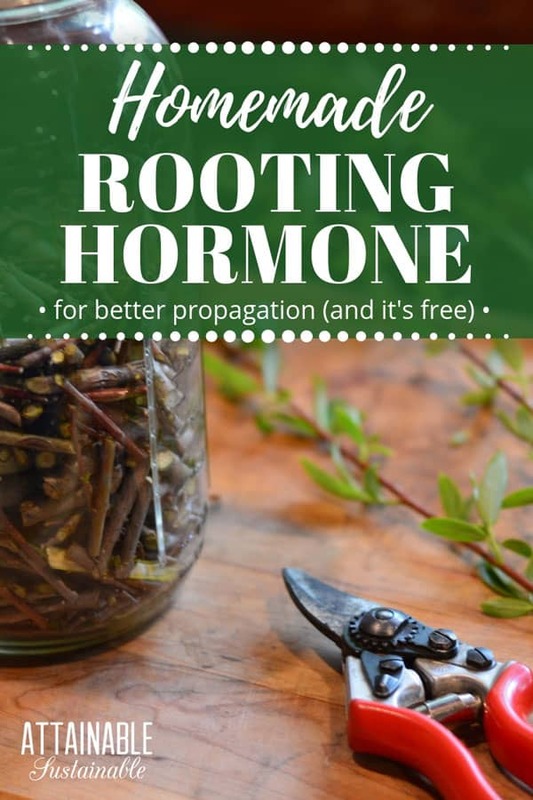 Occasionally use this homemade rooting hormone when watering to promote strong root growth. The plant should show signs of rooting any time from 3 to 10 weeks from planting. Once the plant is showing signs of rooting you can remove the plastic cover. Offer the plant protection for at least a year before planting it out in a permanent spot in the garden. Both layering and air layering are types of propagation where a branch from the mother plant is encouraged to develop its own root system while still attached to the mother plant. When propagating by layering, watering with willow water can encourage root development in the offspring, while also preventing fungal infections at the wound site. Willow water can be used to encourage root development and inhibit transplant shock when transplanting nursery stock to a permanent location in your garden. For all the reasons that willow water helps with propagation, it is also a useful amendment during transplanting. Use willow water to water in transplants when you are dividing your perennials in the spring. Willow water will help the plants’ defense against fungal attacks during this vulnerable time. How long will this homemade rooting hormone keep? The willow water will keep for two months in the refrigerator. Label the jar and date it, including the expiry date. 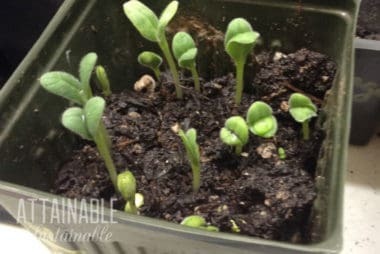 Once you reach the end of its “best before date” use this homemade rooting hormone to water your garden and then make more. But this is only a rule of thumb. It may in fact last longer. 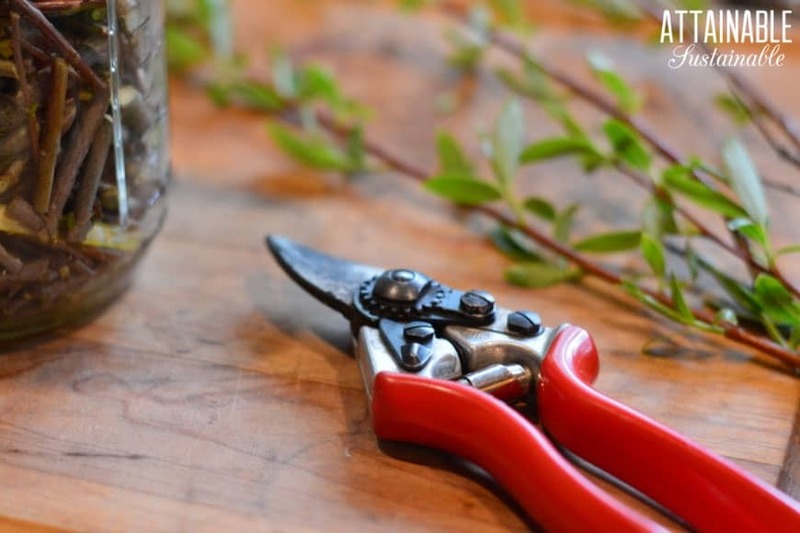 Make homemade rooting hormone and willow water for your propagating projects to save money and create healthier plants. Since the willow growing near you has already successfully defended against the most common pathogens in your area, it can increase your success in your propagation projects. While you’re playing around with willow, you might want to try making your own headache relief. Would weeping willow work as well or only white willow? I might ask at a nursery? This is so informative! well written and clear. Thanks for the info! Would I be able to get bark off of a weeping willow tree? If not where would I be able to get the willow bark? Weeping willow is a salix and should work fine. Hi, I just discovered you, accidentally, and love your tips and ideas. After just reading a few of your articles I’m anxious to give things a try, i.e. microgreens, willow rooting, etc. Thanks for sharing and I’d like to continue learning some of your methods. How would you go about making a willow tea concentrate? Thanks. It’s spelled out pretty clearly here. Maybe I’m misunderstanding your question? What time of year is it best to harvest willow for this purpose?